Remember how excited you used to get as a child when one of your friends had a bouncy house at their birthday party? These inflatable trampolines are also used as the stars of church picnics. Times may have changed, but one thing’s remained consistent. Children go crazy for inflatable entertainment. Adding water to these fun, inflatable, entertaining toys makes it all the better. 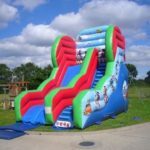 Go with an inflatable water slide for your next event. Kids go to parties for the cake and ice cream. They also enjoy filling up on the sugary sweets they get from the pinata. These high sugar foods often give them more energy then they can handle. Having an inflatable water-slide available gives them a chance to burn off the rush they’re feeling. You’ll be returning less hyper children to their parents. The entire neighborhood will thank you. Childhood obesity is also on the rise. Many can contribute this to larger portion sizes. But, less active child-entertainment devices are also to blame. The kids are staying inside and playing video games. 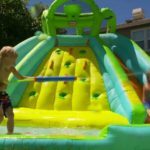 A fun, attractive water-slide will get them off the couch. 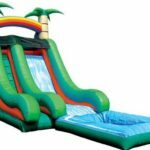 Inflatable water-slides are an investment when you’re purchasing them. Usually, only other rental services decide to do this. 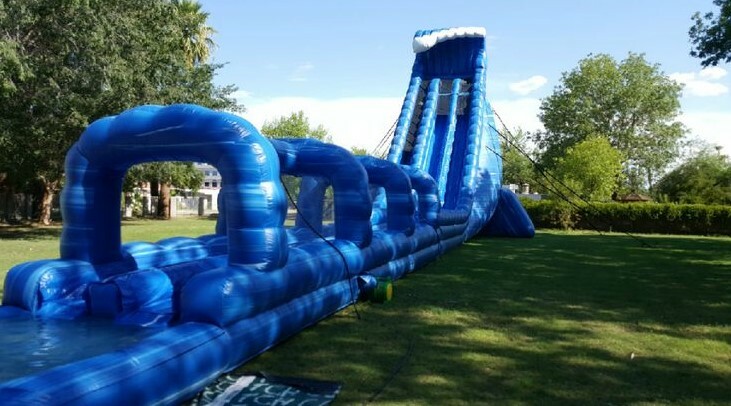 For someone who is only in need of an inflatable water-slide for a party, it’s best to rent. The amount you’ll pay for your rental will vary. It all depends on the quality you choose. The cheapest rental you can find will run you around $150. This is for an inflatable water slide that’s smaller, and appropriate for preschoolers. The cost of your rental can go up depending on two factors. Some inflatable water-slides are quite a bit bigger. It can cost somewhere around $600 to get a really large one. 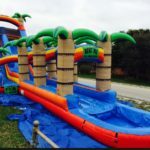 Licensed inflatable water-slides also cost more. 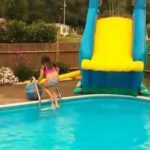 If you would like a Hello Kitty water slide to go along with the theme of your daughters party, it can cost around a $100 dollars more then you would pay for a generic one of the same nature. 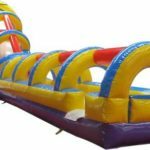 Some inflatable water-slides double as obstacle courses. These are more expensive, but may be worth the investment. Children fight for turns on the water-slide. An obstacle course is an excellent way to distract the children who are in the back of the line. It also adds the extra component of exercise. 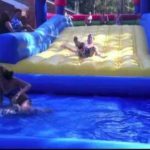 If you’re holding a party full of people who are young at heart, an inflatable water-slide may be a great addition. It will keep your guests amused and you won’t have to watch the activity as much. 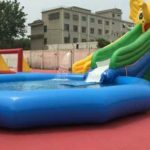 You can’t let children play on inflatable water-slides without supervision. Look at rental companies now. You’ll be able to reserve the slide you want before it is taken. Your kids will think you’re the best parent ever, and you’ll be content in knowing that they’re getting their exercise.